President Trump speaks to the press before departing from the South Lawn of the White House. 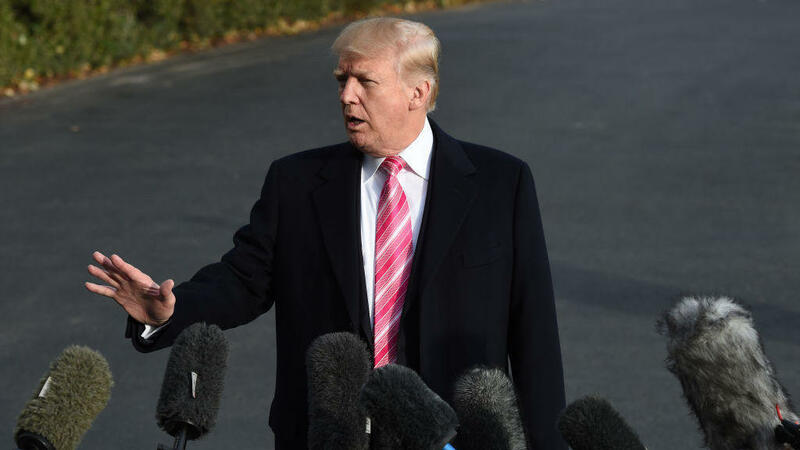 "I can tell you one thing for sure, we don't need a liberal person in there, a Democrat," the president told reporters shortly before departing the White House to head to his Mar-a-Lago resort in Florida for Thanksgiving. "I've looked at his record — it's terrible on crime, it's terrible on the border, it's terrible on the military," Trump said of Moore's Democratic opponent, former U.S. Attorney Doug Jones. Jones is best known for prosecuting KKK members responsible for the 1963 Birmingham church bombing that killed four young black girls, decades after that high-profile crime during the civil rights movement. When asked about the allegations that Moore pursued multiple teenage girls while he was in his 30s and an assistant district attorney in Alabama, Trump responded that Moore "totally denies it" and pointed out that the allegations are from roughly 40 years ago. Trump's argument in favor of Moore is similar to one his advisers have begun to make this week — a GOP vote, no matter the person, helps Trump's agenda and is better than a Democratic vote against tax cuts and other priorities — while still not explicitly saying, "Vote for Roy Moore." "I'm telling you we want the votes in the Senate to get this tax bill through," White House counselor Kellyanne Conway told Fox News on Monday. But other national GOP leaders haven't been as forgiving. Moore has been abandoned by the National Republican Senatorial Committee and the Republican National Committee following the accusations. Senate Majority Leader Mitch McConnell, R-Ky., House Speaker Paul Ryan, R-Wis., and other national Republicans have called on Moore to step aside, but the former state Supreme Court chief justice has refused. Some Republicans, including NRSC Chairman Sen. Cory Gardner, R-Colo., have suggested Moore should be expelled from the Senate even if he is elected. Trump, McConnell and the NRSC backed Moore's primary opponent, appointed Sen. Luther Strange, in the GOP primary earlier this year to fill the seat of now-Attorney General Jeff Sessions. Trump also said Tuesday he will announce next week whether he will campaign for Moore, who has been endorsed by Trump's former chief strategist, Steve Bannon, as part of his "war" against the GOP establishment. Several polls following the allegations against Moore showed him dropping as Jones took a lead ahead of the Dec. 12 special election. Even with the allegations against Moore, Jones still faces an uphill climb in a state that hasn't sent a Democrat to the Senate in 25 years and where, Democratic strategists say, he needs independents and more moderate Republicans to cross over to vote for him. Now Jones is using the words of Trump allies — including first daughter Ivanka — in his latest ad. Ivanka Trump said last week that she had "no reason to doubt" the accounts of the women accusing Moore of sexual misconduct and that "there's a special place in hell for people who prey on children." Sessions has also said he has "no reason to doubt" the women. Trump was also accused of sexual assault by multiple women during the 2016 campaign, and he has continued to deny those allegations. But he has waded into other sexual assault allegations that have come to light recently against Democratic politicians, tweeting criticism of Sen. Al Franken, D-Minn., last week. Asked by reporters Tuesday whether Franken should resign, Trump equivocated but did try to talk about a broader cultural moment of women feeling emboldened to come forward with accusations of various types of sexual misconduct, including sexual harassment and sexual assault — even as he declined to say he believes the women who have made allegations against Moore. "Women are very special," Trump said. "I think it's a very special time, a lot of things are coming out and I think that's good for our society and I think it's very very good for women and I'm very happy" these things are coming out. Moore has been accused by multiple women who say he pursued them romantically as teenagers when he was in his 30s. The first woman to come forward was Leigh Corfman, who told the Washington Post that Moore initiated sexual contact with her when she was 14. Another woman, Gena Richardson, told the Post last week that Moore pursued her when she was working at the local mall, called her at her high school to ask her out and then later gave her a "forceful" unwanted kiss. Moore's campaign has sought to discredit the stories of many of these women and held a news conference in Alabama Tuesday just ahead of Trump's impromptu remarks in support of Moore. Campaign surrogates refused to take questions from the media, however, and Moore has not spoken publicly about the allegations since he spoke with Fox News host Sean Hannity on his radio show, where the Alabama GOP Senate nominee offered conflicting answers as to whether he had dated teen girls back in the late 1970s and early 1980s, when he would have been in his 30s.